Banners, flags, stickers bearing the colors of red, white and green has engulfed every town and city as the province braces for a momentous event-- the inauguration of the Philippine Arena. President Benigno S. Aquino III, together with Governor Wilhelmino M. Sy-Alvarado and Vice Governor Daniel Fernando will join the occasion on Monday for the inauguration of the world's largest indoor-domed arena situated at the sprawling 75-hectare eco-tourism zone in Ciudad de Victoria here. 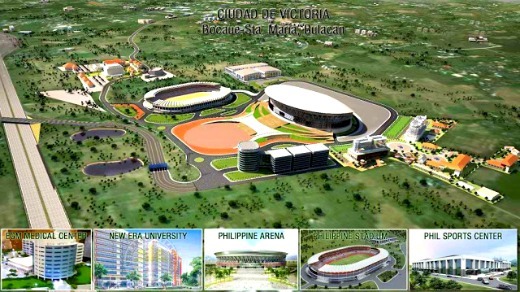 With a capacity of 55,000 seats, the Philippine Arena is owned by the Iglesia ni Cristo and operated by its educational institution--the New Era University. An eye-catching imposing structure, which is built on a 99,200 square meters of land and has a dome of 36,000 square meters, the Philippine Arena is touted as “the centerpiece” of the many centennial projects of the Iglesia Ni Cristo (INC) for their grand celebration on July 27, this year. Alvarado said that some 3,000 policemen are now strategically being deployed in the area and nearby vicinity. He said that since Friday, the Bulacan police headed by Senior Supt. Ferdinand Divina have already been conducting security rehearsals and deployment. “The Philippine Arena is not only the centerpiece of the Iglesia Ni Cristo centenial aniversary but is also gem of pride of the people and the province of Bulacan and the entire nation as well,” he said. The governor said that the opening of the Philippine Arena will further spur growth and economic boom not only in Bocaue but will also spread to the neighboring towns of Sta. Maria, Pandi, Balagtas and parts of Marilao. The arena will not only hold major church gatherings, it will also operate as a multi-use sports and concert venue, capable of holding a range of events from boxing and basketball to live music performance.